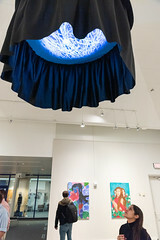 The Art Gallery (TAG) at the University of West Florida (UWF) presents the 2019 TAGGED Student Art and Design Exhibition. This is an annual juried competition showcasing current UWF student work. TAG and the Department of Art host this show to foster creativity, passion in the arts, and the pursuit of artistic endeavor. 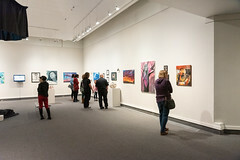 Juried exhibitions are critical in an artist’s practice and development. To fulfill its mission as an academic gallery and pedagogical space, TAG produces this show as an opportunity for students to exhibit artwork from a variety of mediums in a professional environment. Students are encouraged to submit artwork in any media including digital work and graphic design. The exhibition will run from March 28 – April 13, 2019. A reception will take place on Thurs., March 28 from 5 – 7PM. An awards ceremony will begin at 6PM. TAG is located on UWF Pensacola Campus in The Center for Fine and Performing Arts, Building 82. The Art Gallery (TAG) at the University of West Florida, presents SynThesis, a Group BFA Exit Exhibition. This exhibition features work by graduating Bachelor of Fine Art students Chris Borthwich, Ryan Gaynor, Christopher Mills, Selina McKane, Dylan Nadsady, Krista Taylor, Courtney Whitworth, and Lauren Wood. 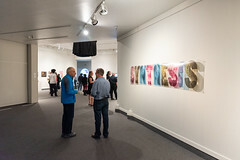 The work on display incorporates a variety of mediums including drawing, painting, fiber, photography, printmaking, digital media, and sculpture. The exhibition will run from April 19 through May 5, 2018. A reception will take place on 4/19, from 5-8 p.m., at TAG located on UWF Pensacola Campus in The Center for Fine and Performing Arts, Building 82. The Art Gallery (TAG) at the University of West Florida (UWF) presents the 2018 TAGGED Student Art and Design Exhibition. This is an annual juried competition showcasing current UWF student work. TAG and the Department of Art host this show to foster creativity, passion in the arts, and the pursuit of artistic endeavor. 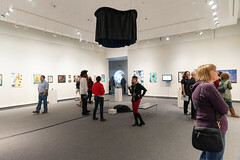 Juried exhibitions are critical in an artist’s practice and development. To fulfill it’s mission as an academic gallery and as a pedagogical space, TAG produces this show as an opportunity for students to exhibit artwork from a variety of mediums in a professional environment. Students are encouraged to submit artwork in any media including digital work and graphic design. The exhibition will run from March 29 – April 14, 2018. A reception will take place on Thurs., March 29 from 5 – 7PM. An awards ceremony will begin at 6PM. TAG is located on UWF Pensacola Campus in The Center for Fine and Performing Arts, Building 82. The Art Gallery (TAG) at the University of West Florida (UWF), presents an exhibition of work by Michael J. Deas and Gregory B. Saunders. The exhibition will run from February 8 through March 10, 2018. A gallery talk with both artists, followed by a reception, will begin at 5:30pm on Thursday, February 8.
standard reference work, The Portraits & Daguerreotypes of Edgar Allen Poe. such as ravens and snakes. The Art Gallery (TAG) at the University of West Florida (UWF) presents “Points of Departure, a Foundation-level Student Art Exhibition”. This exhibition displays the excellence achieved in the foundation courses in the Department of Art at UWF. The objective of “Points of Departure” is to showcase the challenges and successes introductory-level art students encounter in drawing, ceramics, painting, photography, digital art and graphic design. These foundation courses are a crucial component of the program and form the cornerstone to a successful art-making practice. The works created in these classes are presented in a raw, studio-like format to engage students, faculty and the greater Northwest Florida community through a variety of media and expression. The exhibition will run from January 8 – January 25. A reception will take place on Thursday, January 25th from 12 – 3 p.m. at TAG located on UWF Pensacola Campus in The Center for Fine and Performing Arts, Building 82. This reception will include a cookout with burgers, hotdogs, vegetarian options and sides. 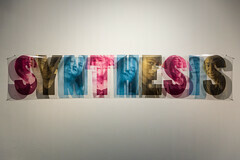 The Art Gallery (TAG) at the University of West Florida, presents SynThesis, a Group BFA Exit Exhibition. This exhibition features work by graduating Bachelor of Fine Art students Jasmine Bennett, Jane Hatcher, Lyani La Santa, and Olga Maria Hilsdorf da Silva. Their work incorporates a variety of media including drawing, painting, ceramics, fiber, photography, printmaking, and sculpture. The exhibition will run from November 30 through December 8. A reception will take place on 9/30, from 5-7 p.m., at TAG located on UWF Pensacola Campus in The Center for Fine and Performing Arts, Building 82.
drawing, photography, ceramics, digital art, video and sound installation. provide context, and hint at each artist’s process. The Art Gallery at the University of West Florida is pleased to present The Irish Experience Exhibition. This exhibition is a selection of artwork by three UWF Department of Art students and one Department of Theatre student who all traveled to Ireland from May 21 to June 19, 2017. Included in the show are drawings, paintings, and photographs that were created while in Ireland during the study-abroad Irish Experience Course. The show also includes mixed-media work, mosaics, and stained-glass that were inspired by these travels and finished in the studio upon return. The three art students made base camp at Carlow College in Carlow Town, Ireland. From County Carlow they traveled the countryside and experienced a landscape and culture that would motivate them to stretch out of their comfort zones. The thirteen UWF students, which also included six students from the Music Department and four from the Theatre Department, traversed Ireland from Dublin to Galway and were introduced to diverse regions where physical geographies merged with lost times and mythic spaces. In the statements provided here, the students have expressed their unique individual experience of Ireland. The students exhibiting work include: Vanessa Evans, Sarah Huckaby, Kassidy Renick, and Elizabeth Blanco Sáenz. One common observation was a sense of the sacred in the places visited. The students and instructors from art, music, and theatre were able to tour castles, cathedrals, museums, historic sites, ruins, a famine ship, sea cliffs, and mountains. Additionally, students had the opportunity to study Irish history, art history, language, and music at Carlow College. The Department of Art students were given the chance to practice their craft and challenge themselves in ways not possible without visiting a new environment. Throughout this journey, the art students had several master classes with various professionals. These classes included a plein-air workshop with Mary Cullen and a studio visit with Jacinta Crowley. The students also had the opportunity to meet with the prestigious VISUAL Centre for Contemporary Art Curator Emma-Lucy O’Brien, engage in a behind-the-scenes museum tour with renowned Museum Director Dermot Mulligan, and become enthralled while on a special tour of Carlow College’s permanent art collection with Collection Specialist Bridget Flannery. The Irish Experience Course was a dream that often felt unreal. This was a life-changing opportunity for which we are all extremely grateful. As the instructor invited to guide the Department of Art students, I would like to personally express many thanks to Charles Houghton, Blake Riley, Catherine Ryan, and Sr Mary Murphy for this amazing chance to represent UWF and help all the students involved fulfill their passion and realize their potential. The relationships cultivated with these students and colleagues will facilitate mutual creative growth and partnerships between each department and throughout our lives. The Art Gallery (TAG) at the University of West Florida (UWF), presents Ars Musae, an open studio residency and exhibition by Marzia Ransom. The title of the exhibition references the “muses of the arts” and alludes directly to a large scale painting Ransom is currently working on in the gallery. Marzia Ransom, a UWF Alumnae with a Masters of Fine Art from the Massachusetts College of Art and Design, has been invited to use TAG as a public space to experiment and push her craft as a painter, photographer, sculptor and installation artist. TAG’s summer residency project is designed to peel back the studio’s curtain and facilitate lively conversations between artists and audiences. Every Wednesday and Saturday, from July 19 through August 23, TAG invites the public to join Ransom as she utilizes the gallery as an open studio. Please stop in from 1pm-3pm to witness her creative process and ask questions about her work. The residency culminates in an exhibition that opens August 22. The public is invited to a closing reception and gallery talk that will take place on Thursday, September 7, from 5-8p.m. The gallery talk with the artist will last from 5-6pm. TAG is located on the UWF Pensacola Campus in The Center for Fine and Performing Arts, Building 82. All events are free and open to the public. Check out our Artist and Faculty Spotlight page for more info! Join the Pensacola Museum of Art for an evening of discussion and presentation by two experts in their fields, Robin Blyn and Deborah Walk as they share their own research as well as discuss museum history, sideshow, gender, photography and other themes within Hustle: Museum of Spectacle, an exhibition currently on view through August 5. Robin Blyn is a UWF English Professor and author of The Freak-garde: Extraordinary Bodies and Revolutionary Art in America. Deborah Walk is recently retired Assistant Director of Legacy and Circus & Curator at The Ringling, Florida State University and co-author ofCircus! The Photographs of Frederick W. Glasier. Visit @pensacolamuseum for more info!